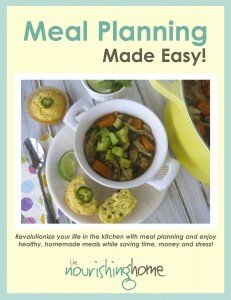 Making a Meal Plan is the key to saving time, money and stress in the kitchen! UPDATE: I have great news to share! You can now view my Mastering Meal Planning presentation as well as download the course handout I provide to local friends who attend my Mastering Meal Planning presentations throughout the Southern California area. Simple visit Free Video Course: Mastering Meal Planning to watch my free eCourse on meal planning. Or if you’d prefer, I’ve kept this post in place for those who would like to read through much of the information contained in my Mastering Meal Planning Presentation. I’ve also included a sample (picture) of one of my meal plans for your reference, as well as free pdf downloads of my meal planning templates for use in creating your own meal plans. My goal is to help busy families eat healthy, well-balanced meals on a budget by teaching meal planning strategies that truly save time, money and stress in the kitchen! So, when you’re finished reading this post, please check out “Cook Once, Eat Twice or More,” for additional helpful strategies to save time and money. I also provide all-inclusive full meal planning kits for FREE to subscribers of The Nourishing Home. Each GF Meal Plan Kit includes the weekly meal plan, PLUS a handy shopping list and helpful prep ahead task recommendations to make getting a healthy meal on the table a snap! • First, create a “Master List of Meals” that your family enjoys. Your Master List of Meals is simply a listing of all the meals that you make. For example, a few of the meals on my Master of List of Meals include: Chicken Pesto Pasta, Taco Salad, Spaghetti & Meatballs, etc. Taking time to really think-through this first step will save you a ton of time in the long run – no more racking your brain to try to think of what you should make for the week. Simply look at your Master List of Meals each time you make your weekly meal plan. And, as you start trying new recipes, remember to add the ones your family like to your Master List of Meals. • Never make your meal plan without first consulting your calendar of events for the week and make sure to confer with your spouse too. Take a look at what is happening each day and plan your meals accordingly. For example, if you have a super tight schedule on Tuesdays, plan for it to be a quick and easy-to-prepare meal night. Or plan for it to be a “left-overs night” where you can simply warm-up a meal from a previous evening. Ensuring you actually have left-overs for “left-overs night” is simple when you plan ahead for it – just make extra of a meal that reheats well, and “voila,” leftovers night! • Plan to make more complicated meals (or try out a new recipe) on the days you will have the most time. For example, if you have more time during the weekend, then save a new recipe or a more complex meal for the weekend – don’t try to tackle it on a day you’ll be short on time! • Before making your weekly meal plan, check your frig, pantry and freezer to see what you already have on hand. then, plan meals to use those items – using what you already have on hand will really help you save MONEY! • Be sure to utilize the “secret” to quick and easy meal preparation – grouping meals to cook once and eat twice or more! By planning ahead to group meals, you will be able to pull-off a healthy meal even on the nights you’re pressed for time! See post on Cook Once, Eat Twice or More. • Keep a pad of paper on your kitchen counter and jot down items as you run out of them so they can quickly and easily be added to The List. 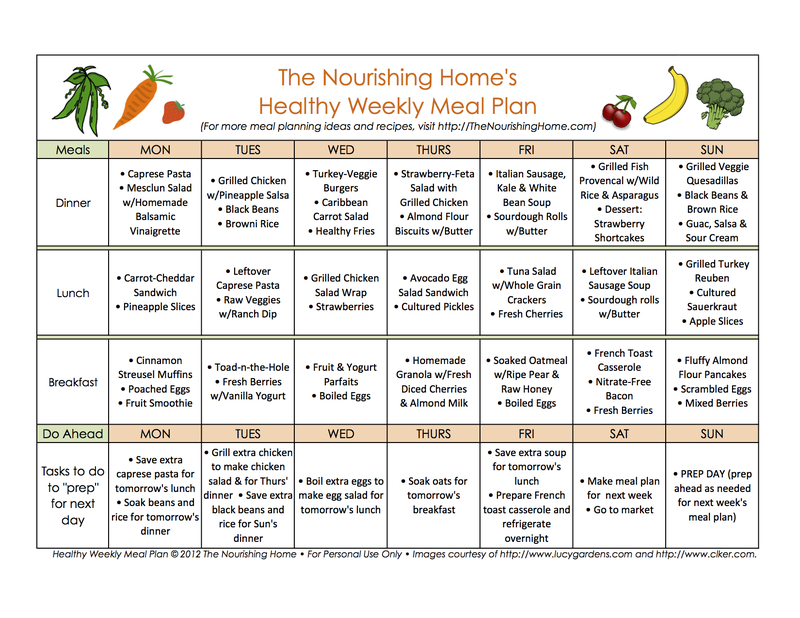 • Make your meal plan for the week and then go through each meal and list out all the ingredients needed to create that meal. First, check your frig, pantry and freezer to see what you already have on hand. Any missing ingredients go on The List. • Never go to the market without The List! It is a sad, sad day when you lose or forget The List. Keep a careful eye on it! • Clean out your frig and pantry before heading out to the market – remove expired food and old leftovers you can’t use (hopefully you won’t have much as you become BFF with your meal plan), rearrange and reorganize food on the shelves for ease in locating, take one more look to see if you need something not on The List (e.g. did your loving hubby or child put the milk back with just a few drops left in the carton?). Reorganizing your frig and pantry ensures you know what’s on hand, where it’s located and enables you to quickly and more efficiently unload your groceries when you return home from the market. • Go to the market alone whenever possible to avoid distraction and temptation – so you can limit the purchase of unnecessary items. • NEVER go to the market without your shopping list! Without “The List” in hand, you will forget something and you will buy things you don’t need! • NEVER shop hungry! You will find it extremely difficult to resist the temptation to impulse purchase when hungry. So don’t put yourself in that position. • If you must make an impulse purchase, limit yourself to one or two items at most.It’s good to try something new, but only if it’s healthy and only if you’re certain that you’ll have time to actually incorporate it into your meal plan for the week. • Frequent the same one or two markets regularly. By shopping at the same place each week, you will become very familiar with the store and will be able to more quickly navigate through it, thereby saving time and energy! • Shop early in the morning, if possible. Most markets restock at night, so you’ll have the best, freshest selections by shopping in the early morning. • If you have extra time to shop, check out Farmer’s Markets for produce, they are generally less expensive and have fresher selections since most come from local farmers. • Meats: Cut and divide meat into portions based on your meal plan and freeze (you can even place the meat into a marinade and freeze). Use ground meat to mix and form into meatballs and burgers that can be frozen for later use. I also like to precook and freeze ground meat for use in meals like tacos, chili, soups, etc. • Veggies/Fruits: Chop any veggies/fruits needed for recipes (that can keep well once chopped). For example, I find it super helpful to pre-chop, rinse and store lettuce for salads for the week ahead. • Other: Prepare anything that can be prepared ahead of time, e.g. bake a batch of healthy muffins and freeze them for snacks for the week ahead. Cut your chicken breasts horizontally into thinner breasts – thinner breasts cook faster and are also a better individual portion size. After cutting the breasts, place them in a ziplock freezer bag with your favorite marinade. Either freeze immediately or place in the frig and use within 24 hours. (After 24 hours, the marinade tends to make the meat too soggy.) To defrost froze chicken/meat, place in frig 24 hours before cooking. If you can grill it, GRILL IT! Grilling is so fast, easy and there’s virtually no clean-up necessary. You can grill everything from chicken and turkey to fish and beef. If you don’t have a good propane grill, I recommend that you seriously consider investing in one! For a healthier, yet just as quick breakfast for your kids – phase out all those frozen waffles, pancakes and French toast brands you’re purchasing and replace them with your own homemade, healthier versions. Even the healthy brands are not as healthy as homemade and they are much more expensive per serving! Simply plan ahead to make a big breakfast (or have breakfast for dinner) and make a double batch of homemade waffles, pancakes or French toast and individually wrap and place in freezer bags the leftovers. Then simply take them right out of your freezer and place into your toaster oven for a quick, yet healthy breakfast. Since our kids take their lunch to school everyday, healthy and easy kid’s lunch box sides are a must in the Smith house! So to save time, the kids and I prep the sides on Sunday afternoon for the week ahead. You can use either mini-snack-sized baggies, or if you want to be more sustainable, use mini-plastic containers that can be washed and reused. You can place healthy sides into these, such as fresh cut veggies, fruit, nuts, etc. Here’s a secret for making your own fresh-sliced apple sides for the week ahead: Cut apples and place into individual containers with a dash of pineapple juice, shake well to distribute the juice – they will stay fresh all week. And are so yummy! Pam, thank you so much for all your kind and encouraging words! I’m so glad the Lord led you here through the various pages you were viewing! So welcome, it’s great to have another Christ-loving friend! 🙂 Yes, I do believe that taking one step at a time is key! It’s just too overwhelming to try to change everything all at one time. I have a few tips to add. I plan AFTER I have seen the ads for the week. I keep a very well-stocked pantry and freezer, but we like fresh produce, so my menus depend on what’s on sale in the produce section. Bell peppers mean fajitas that week; potatoes mean hash browns, etc. My menus are not day-to-day like yours. My husband is a truck driver and I have no idea what his schedule will be day-to-day. One night, he might be home at 6 PM, but need to go to bed ASAP cause he has to get up at 2 AM; next day he might not get home until 10 PM. I often don’t KNOW this until 5 or 6 PM at night! So… I just decide on 6-8 breakfasts, lunches and dinners for the week and then wing it each day. I also double up each of those, so we have the same meals twice, which means I only have to come up with 3-4 ideas for each meal for the week. I cut up ALL my produce that I possibly can before putting it in the fridge. Even if I “plan” for us to eat melon balls with breakfast a few days, there will be more melon balls than we need. If they’re cut-up, we eat them instead of them rotting in the back of the fridge. Similar with salad, if you have lettuce and tomato precut, you wind up throwing it on sandwiches instead of just waiting for when you planned salad with a meal. Prepped fruits and veggies get eaten. It’s handy to run onions, carrots and celery through the food processor and fry them in coconut oil or butter in advance. So many recipes start with this anyways. I do a ratio of 1 onion to 2 carrots and 2 celery stalks. Plus you can add them to a lot of things that maybe the recipe didn’t call for these veggies, meatloaf, meatballs, sloppy joes, soups, stews, omelets, and just up your veggie intake by adding them. Before I began doing this, most of my celery always wound up frozen for the stockpot. I COMPLETELY agree with not shopping hungry as food you didn’t intend to buy seems to jump into your cart. And it’s always junk food. However, even when I am not hungry, if at a farmer’s market, or a store with a gorgeous produce section like Wegman’s, I can easily go overboard on fresh produce without a list. I wind up at home, unpacking, realizing if we ate nothing but produce, we’d never get through it before it goes bad. This is my worst habit when grocery shopping, overbuying produce cause it all looks so good. My “cure” for this is… I start next week’s menu when I’m in the store. Yes, those artichokes DO look awesome, I’ll plan to do some next week. Breakfasts are tricky because I am not a morning person and sometimes hubby’s mornings are WAY too early for me. I can do scrambled or fried eggs or oatmeal fast, but if breakfast is something more complex, like a frittata, I do it the night before so I just have to reheat in the morning. I know myself well enough to know I am not cooking something that complex until I’ve been up a few hours. And French toast or panckes are only for weekends. For hubby’s lunches, I do wraps, as it’s much easier to shove lots of veggies in than a regular sandwich. He usually has at least 3 “sides” in baggies or small tupperwars, cut fruit or a banana, nuts or seeds, cut up carrots or cukes, pudding or applesauce, and/or home-baked goods (banana nut bread, apple betty, pumpkin pie – my baked goods always have fruit or veggies and are low-sugar compared to stuff he can buy at a truck stop). If he has a short day, he might not finish all that, but if he has a long day, I know he won’t be starving and stop for junk before he gets home. I spend less than an hour on Fridays putting groceries away, cutting up most of my produce. I spend 3-4 hours in the kitchen on Sunday, precooking a lot of the week’s meals and doing any baking that needs to be done for that week. Otherwise, I spend about an hour a day, fixing things that need to be done at the last minute, packing lunch, doing dishes, soaking beans, putting away broth, setting something up in the crockpot, etc. It’s NOT a lot of time for all homecooked, healthy meals done rather frugally. Just popping over from TBM and the biweekly plans. I went through a nutrition class a few years ago at our local county extension service & that was so helpful in learning how to menu plan. I don’t break down my menu plans into specific nutrient evaluations to make sure my 4 kiddos are getting enough of everything; I just aim to serve healthy, balanced meals with protein, carbs, fruit/veggies and hope the variety during the week gives them everything they need! Hi, Cheryl! Welcome to The Nourishing Home! Thanks for popping over from TBM to say “hi!” I just adore TBM and praise God that He has enabled me to be a small part of this amazing ministry. Thanks for your question. It’s a good one to ask! There are a couple of reasons why I would add eggs to a breakfast of muffins and smoothies. One is for the benefit of the extra protein since research studies show that high protein breakfasts better satisfy appetite, and also help to regulate blood insulin levels. And even without reading research studies, practically speaking, I simply witness it firsthand that serving a breakfast of a muffin and smoothie just doesn’t cut it when it comes to satisfying my two preteen boys’ hungry appetites – LOL! So by adding eggs in some form, the meal becomes more satisfying and yes, also increases the protein content, which is great for many reasons. Again, research shows that protein is especially important to start your day (after all you’re breaking fast) as it helps to regulate blood insulin levels. That’s why, I also serve either a boiled egg or side of turkey bacon or sausage when having oatmeal or rice porridge for breakfast. With that said, when my boys were little, I found that yogurt, a high protein muffin (such as a muffin made with almond flour or coconut flour) and some fruit was plenty to satisfy them. So just keep an eye on it and if you’re noticing that your children are hungry within an hour of eating a meal, that is usually a sign they need more protein and/or are not eating enough at the meal. Kids are not static, but are constantly changing/growing, and those growth spurts can definitely impact hunger levels. This preteen phase is starting to make me think I may need to get a part-time job to feed them. LOL!! Thanks, Kelly! We do have three boys (7,5, and 3.5) and a 9 month old girl. I think you’re right; I probably need to add extra protein, because it seems like an hour after feeding them a healthy breakfast, they’re foraging again 🙂 I can’t keep up with the kitchen! Thanks for the tips! Thank you, Kelly for the meal planner template. I stumbled across your website while looking for brown rice porridge recipes and was instantly attracted to your colorful banner and catchy title, “The Nourishing Home.” I have done weekly meal plans in the past, but after a few weeks, my good intentions fall by the way side. I’m hopeful that the tips on your site will be enough to keep me motivated. One thing I’d like to share that is helpful for me in the fall/winter months, is to use leftover lentil soup as a base for shepherd’s pie. All I need to do is add the cooked ground beef to the lentil soup (which has thickened to a stew like consistency over night) and top with garlich and herb mashed potatoes. Thanks again. You are a blessing! Thanks so much, Josie, for taking the time to say Hi! It’s great to meet you and I truly appreciate your kind words and GREAT idea! Love it! I’ll have do that this winter and post about it. So thank you for sharing! As far as meal planning goes, a great way to keep it going is to plan fewer meals. If you start out slow and remain consistent, it’s a lot easier to build on that success. So if you were doing a dinner meal plan only, then perhaps only plan 3-4 dinners per week for about 3-4 weeks and then add from there. If you were trying to plan everything – breakfast, lunch and dinner – then pull back and perhaps only plan dinner for awhile until you’re consistently meeting the goals you’ve set, then go from there in adding additional meals. Just planning 3-4 meals a week, especially focusing on planning those meal for busy nights, will go a long way in helping you and your family eat healthier and save time and money! I got here thanks to Google, and was greated by “Nourishing Traditions”, which I’m slowly working my way through. My challenge is that I am single and usually make small trips to different food stores during the week. I also like variety, don’t fancy elaborate cooking weeknights, and want to get more grains and beans into my food regime, while having small portions to help reduce my chunky stomach and hips. This means that I need advanced meal planning skills. It seems overwhelming, really. Do you have a set planning time and day of the week, when you make out the list? How can I plan so that I have the right portions per serving, etc? Also, the great thing about meal planning is that it is so customizable. So you are in control to determine what meals work for you based on your healthy eating goals (again see post above about setting goals) and can determine what portion sizes are best for you as well. A great way to plan out portion sizes is to look at the number of servings listed in a recipe and then adjust accordingly. You can either reduce the recipe so you don’t have any leftovers, but I recommend having at least one extra serving that can be refrigerated or frozen for a later date. Of course, you can make a full portion if you want a lot of extra servings to store for future meals that are quick to reheat on busy nights. Yes, I do have a set day for meal planning and for prepping (usually an hour or two) and I highly recommend scheduling time on your calendar to make out you meal plan each week. Making meal planning a priority will really save you so much time the rest of the week, as well as keep you on track with your healthy eating goals. dear kelly… i stumbled across ur website and I must just say i was amazed.. I recently read the book Nourishing Traditions that I got from my mother in law and I must just say I was in love with it.. Gave me some much needed advice on some things.. I am a mother and wife.. and its my desire to feed my family the healthiest most possible way I can but also doing it with a reasonable amount of money which we all know is hard these days.. Its just been within the last several years that I have been changing my habits as far as eating and being more organic.. I make my own bread by grinding my own berries… with a Nutri Mill.. make my own soap and so on. etc.. Its so exciting and amazing to me because the possiblities are endless and almost overwhelming at times… I just wanted to say that it was very encouraging to read ur blog and know there is other women out there like me that care about feeding their families healthy.. If u can give me any tips on feeding a 4 and a half year old and kinda what he should be eating that would be greatly appreciated.. May God bless you! Dear Kelly thanx so much for the post it was very encouraging.. I was just wondering what you think of Raw milk? and also where do u reccomend buying ur meats n fish? what snacks would u recommend for my son? Hello! Do you have any advice or tips for a picky eater? I would love to just use your premade meal plans but my son wont eat alot of things on there. He is almost 3 and all he will eat willingly is sandwiches and fruit, but anything else, even just placing something on a plate in front of him, he will run crying to his room. He used to eat everything and was just so in love with food and he has slowly dwindled down to just a few things. It breaks me because I know that he isn’t getting all the nutrients from a wide variety of foods, but I can’t let him go hungry either. Im lost at this. Hi, Kayla. I’m sorry to hear you’re struggling with how to encourage your son to eat a wider variety of healthy foods. It sounds like he has some taste/texture issues and I don’t know the situation at all, which is why it’s hard to respond, but I wonder if he may have some food sensitives, or if food has become a source of tension, since you comment that he becomes so upset that he cries when something new is introduced. I am by no means an expert and I have had my share of picky eaters – be assured that the toddler age is a very common time for picky eating habits to develop. Toddlers become very aware of what they like and don’t like and generally (not all) prefer simple foods, this coupled with the emerging independence at this age can make food a control issue, since it’s one area that they do feel they have most control over. There are lots and lots of theories and advice on how to deal with a picky eater, just do a quick google search and you will find a plethora of advice. 1. Don’t bring unhealthy foods into your house. If you do, be assured that’s going to be what they almost exclusively want to eat. If you already have a habit of this. Don’t toss them all out at one time, that’s only going to lead to a complete meltdown for you both. Slowly remove one unhealthy food at a time, some you can replace with healthy versions and some will just need to hit the road. 2. Talk to your son about healthy food – what it is and why it’s important. Even at this young age, he can begin to understand why healthy food is important. But don’t make it a lecture, invite him to participate. Look at magazine pictures (or a cookbook) of healthy foods and even better, get him in the kitchen with you doing fun tasks that only take a minute or two to accomplish (see my Kids in the Kitchen section of this site for ideas and recipes) – use this time to have a two-way conversation together. Do this daily (talk). Let him know you’re serving healthy foods for a reason. 3. Make a meal plan that works for your family. Invite your son to participate, by asking him what healthy foods he’d like on the meal plan (give choices to help guide him, see #5). Then invite the rest of the family to do the same. I do this with my two boys and hubby – each person chooses what they want on the meal plan that week from my master list of meals. Then the rest of the family (even if it’s not their favorite) eat it – we call it “taking one for the team” because they know we’re going to eat their favorite dinner when it comes up in the rotation later in the week. 4. If you suspect food sensitivities may be an issue, look into it. Even good foods can be troublesome for some people. Kids can develop food allergies and sensitivities at any age, but toddlerhood is a big time when they seem to surface (or more likely become most noticeable). Common allergens include wheat, soy, dairy, nuts … it can be very hard to know which foods are causing the issue. But if your child is prone to physical symptoms such as bowel issues, bloating, gas, rashes, behavioral issues, and just feeling ill in general and therefore not wanting to eat, it may indicate an underlying food allergy or sensitivity. So if you suspect food sensitivity may be an issue, then seek out a good naturopath/physician to help you – there are blood tests and allergy panels that can help, although they are not always 100% accurate, which is why food intolerances often take some time to figure out. There are also many books available that can help you to uncover potential food allergens by using an elimination diet method. 5. Remember you’re in charge. You don’t have to be an iron-fisted dictator, but it’s important to remember you’re the parent and that kids of all ages are going to push boundaries and use all kinds of tactics in an effort to get their way. Give choices, so your child has some level of control – they want and need that. But remember you’re the leader here facilitating their choices. And the more you include them in conversations about healthy food, and have them prepare healthy food alongside you, the easier it will get as time goes on. It does take time and patience to move naturally picky eaters toward expanding their horizons. I hope this helps. Again, I’m no expert here. So I encourage you to talk about this with your husband, pray to the Lord about it and seek His direction and strength, and keep seeking out ideas for helping your child eat healthier, including seeing a physician you trust, particularly if you are concerned abut food allergies. Just remember it’s all about baby steps – one small step at a time leads to healthy habits that last a lifetime! Thank you for your advice. My husband has crohns as well as other digestive issues and my son has sensory processing issues. Even if someone else is eating something he doesn’t like he will start gagging. We believe that my son is starting to get the same issues as his father, but now we know about the sensory so that has helped alot. Thank you again for your advice! I am so happy to have stumbled upon your site. This information is much needed and appreciated. I am a single woman with no children but still struggle with how to plan meals. Cooking for one is a challenge in itself but I feel that I will be able to adapt this information to meet my needs. How to manage food can be overwhelming for me so just these getting started basics are very helpful. Thanks so much! Your template and handout are awesome! So glad you found this helpful, Kelli! Thank you for taking the time to leave a kind and encouraging note! Blessings, Kelly! Hi, Nicole. I want to encourage you that as I mention in my meal planning presentation (video), I didn’t start out this way … planning all our meals. So please know that I always recommend taking slow, steady steps forward. Even planning just 2-3 meals a week will go a long way in saving time, money and stress. Then as you get used to planning, you can add meals from there to your meal plan. The best meal plan is the one that works for you and the one you can stick to without being a short-order-cook as much as possible. I try not to be a short-order-cook because that’s just too time consuming, but yes, there are some meals I do have to make minor adjustments to because of picky people in my house – LOL! 🙂 I just don’t note this on the meal plan. An example is on a day I serve yogurt for breakfast, my oldest who doesn’t care for yogurt has granola with almond milk and fruit instead (a simple substitution that doesn’t require extra work or time). Or another example would be my husband who doesn’t care for egg salad will get leftovers from dinner in his lunch box instead. I’m curious about the books that are in your meal planning picture. Can you tell me the titles? The other book is a wonderful recipe book that came with my Vitamix blender. It’s called Whole Food Recipes and has lots of great recipes for using the Vitamix to create soups, sauces, salad dressings, smoothies, etc. I believe you can only get it with a Vitamix purchase. 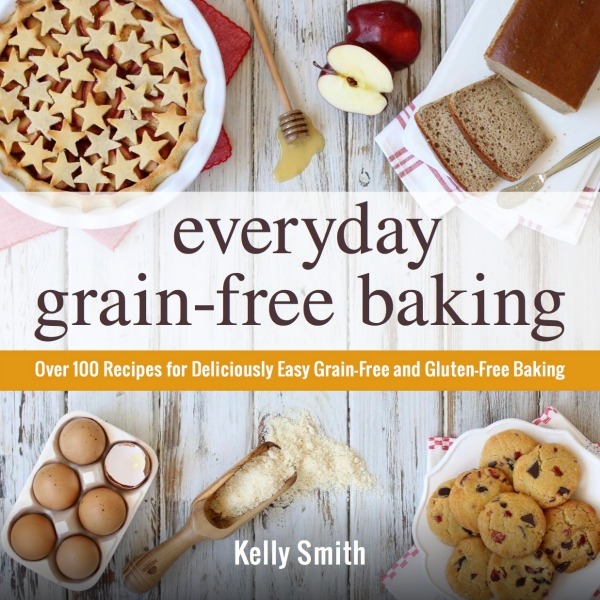 However there are many great Whole Food cookbooks out there that I recommend. I’ll be doing a post on this soon, but here’s a brief overview in a Christmas post I did, if you’re interested. 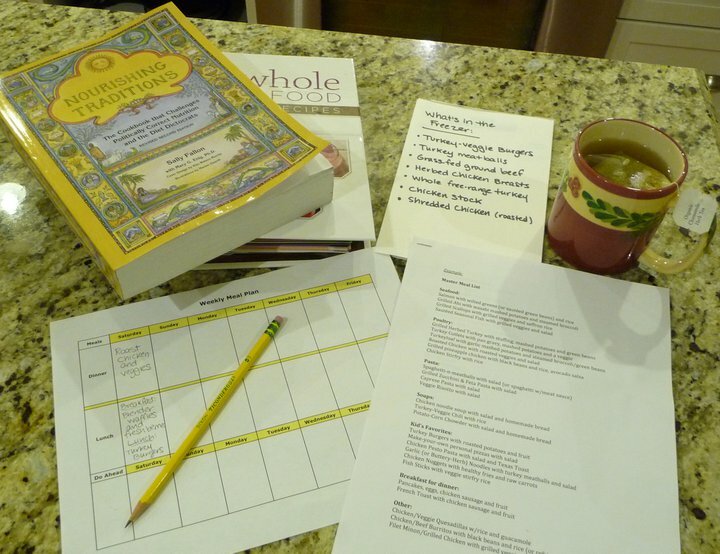 I also love the Whole Life Nutrition cookbook from nourishingmeals.com. Her recipes taste SOoo good. I was spending way too much time in the kitchen ( and not with my kids, which is the point of homeschoolint)nd too much money, so I realized I need a plan instead of winging it each day….which is how I came across this website. And it was so nice to find a GF plan. My kids can’t do dairy, and I’d like us to go gluten free ( i started because of arthritis at 39), but a lot of meal plans have a lot of bread and dairy. One other benefit I’ve noticed when i do plan is I’m way more comfortable having the kids help me in the kitchen. They’re still little and if I’m winging a meal I just want them OUT of the kitchen.